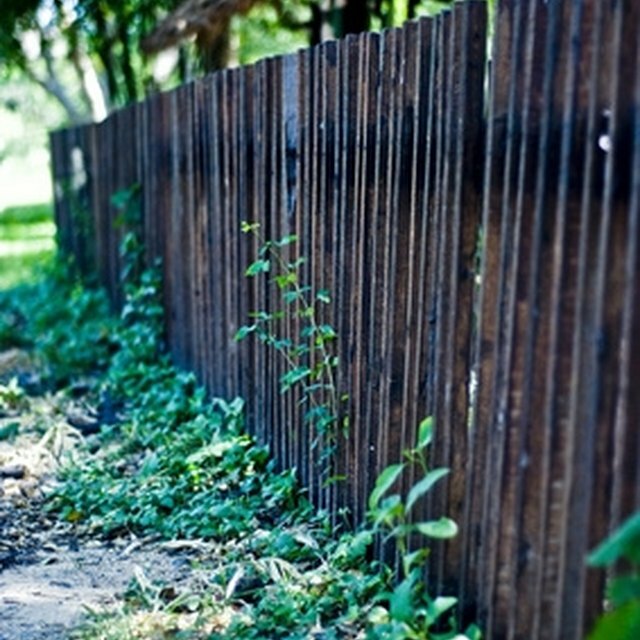 A well-maintained wood fence can be asset to any property. It not only provides a homeowner with privacy but also can enhance the beauty of the yard. Designing one you like will take some research, but there is a lot of information available from which new ideas are born. Make a list of the purposes a wood privacy fence serves. Be exhaustive; include all events that take place in the yard that you would like to be private. Prioritize the list from most often to least often. Consider the fence's duration. Wood privacy fences are built from pretreated lumber that can be preserved for many years. When they are sealed for protection, they keep that "new" look longer. Consider the various options available for the top of the pickets. The fence posts are usually set on a pattern. This means they are the same distance apart for the entire fence. A pattern designed to fit between posts could be used for the entire length of the fence. This is where a wood privacy fence has an edge over vinyl or brick. Jot down your ideas, no matter how ridiculous they may seem at the time. You should sketch your ideas as they come to you, so allow plenty of time for the design to fully mature. Use graph paper to help keep the height and pattern of the wood privacy fence in perspective. Research is the key to creating anything new, so do your homework on variations of wood privacy fences to help base your design on established methods. The normal height of the pickets for a wood privacy fence is 6 feet. This does not mean that your design has to conform to that measurement as lumber can be bought in different lengths. Keep in mind that when straying from the regular picket length you will have to special order the pickets or make them yourself. Take a trip to the local lumber retailer and look at different types of material used for fences. Hold it in your hand and check the weight. These are facets that help determine the longevity of the fence. Study the process of installation and finishing (painting or sealing) of a fence. This knowledge will add to the dimension of the design. Include a gate in your design to make the wood privacy fence complete. Do not allow yourself to be limited in your design by what everyone else uses in the design of their fence. Do not readily accept information found on the Internet as valid. Always find another information source to confirm it.